by Dave from The Longest Way Home ~ February 29th, 2012. Updated on August 30th, 2017. Published in: Travel blog » Nepal. – Since this post, I’ve been to EBC and other treks in Nepal several times. In fact, I’ve written many guidebooks about all Nepal between then and now! This post is in its original format from my first trek to Everest – I hope you enjoy it. Even in the middle of winter the sun shines brightly in the mountains. Tengboche was our next destination, home of the worlds highest monastery. It would be a cold night ahead on a mountain peak as we looked down and could see snow further ahead. So for now I was enjoying the brief respite of the suns warmth. All around us on the sunny side of the mountain were brown grasses and hard dark wood shrubbery. A very different landscape from the day before. It was here in the wooden colored undergrowth I came across the one thing the Everest region has a lot of. But also something you rarely get to see: wildlife. In this case the rare huge wild mountain goat known as the Nepalese Tahr. Camouflaged against the earthy brown mountainside it would have been easy to miss the herd of Himalayan Tahr. But the group had split and were crossing the trail as we made our way down. I’ve never seen goats like this. More like a cross between a giant sheep and yak than timid mountain goat. 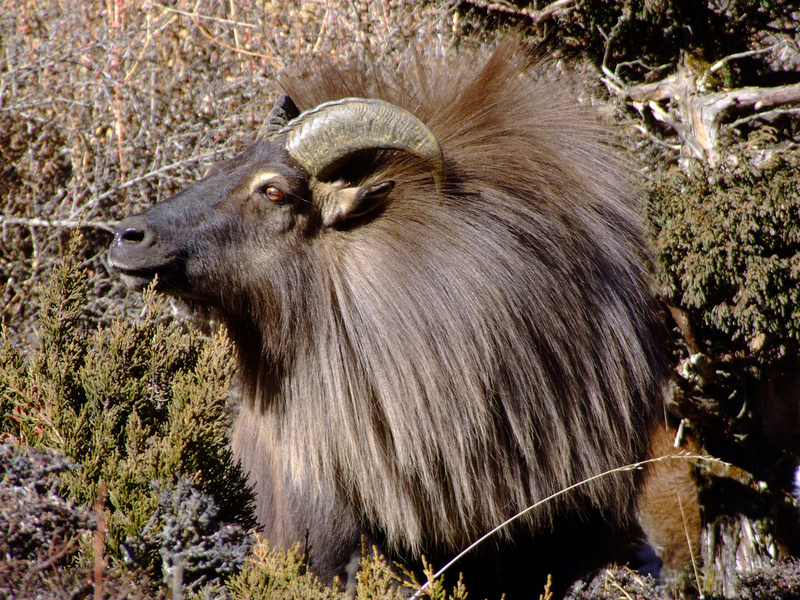 The alpha male Tahr was just as you’d expect to see on the discovery channel. Very impressive. A glossy thick brown coat of long straight hair covered his body as if straight out of a beauty salon. Yet, stuck out around his neck similar to the style of a lion’s mane. Larger than a sheep his face was strong in character and clean-looking. While crowning his beauty directly above were strong dark horns. Surrounded by much smaller and shorter haired females they cooed and bucked their legs around him. Other males coats were nowhere as long and thick as his. They kept their distance as he surveyed the sun warmed patch of hillside they were feeding on. Once hunted for their formidable horns and the alpha males thick wool coat the Tahr is now protected in Nepal. 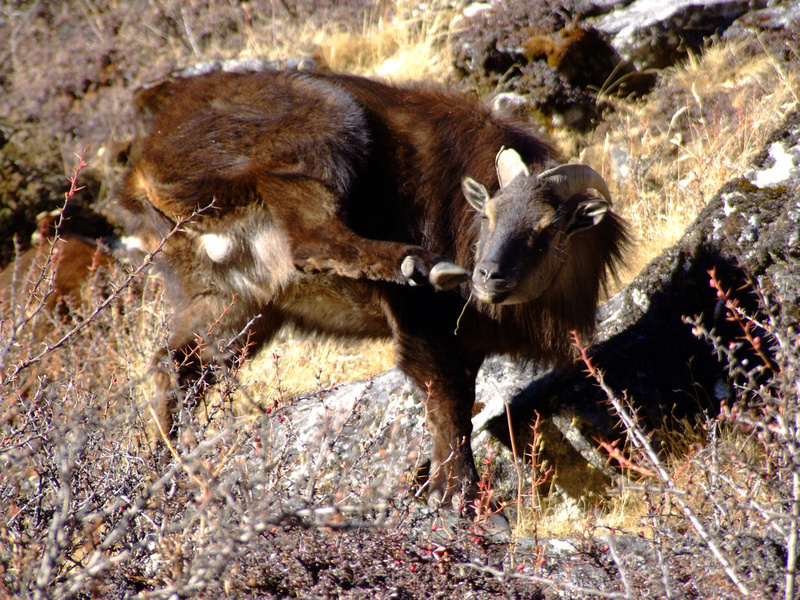 Very sadly there are still companies offering big game hunting tour packages to kill blue sheep and the Tahr in Nepal. 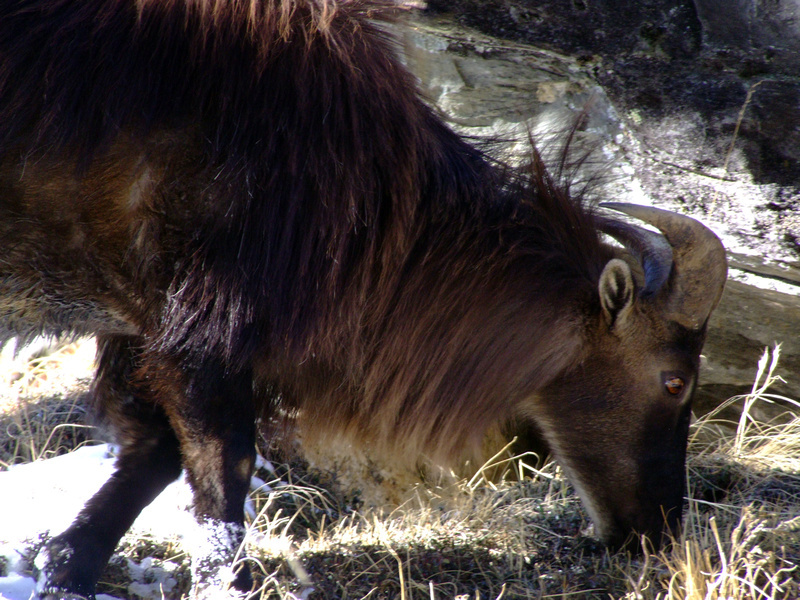 The Tahr wild mountain goat: a pest or an endangered species? The Himalayan Tahr has been introduced to other countries such as New Zealand and South Africa where it’s known as a pest. However in the ecologically fragile country of Nepal it has been hunted for game trophies to near extinction. The IUCN (International Union for Conservation of Nature) has the Himalayan Tahr in Nepal listed as protected. 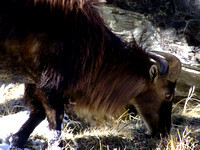 Nepalese locals are very much aware of the Tahr’s protection and mention it often. However they are out numbered by rich hunting tour groups. It boggles my mind that companies are allowed to hunt a dwindling species like the Nepalese Tahr while in other countries it’s a fight to keep their number down. 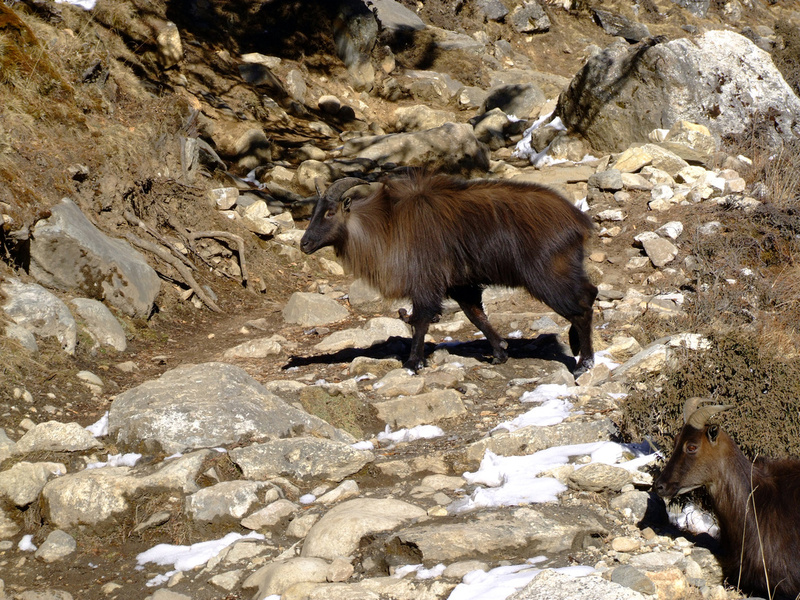 I believe there is a case for strong government legislation and paperwork that prevents easy hunting of the Tahr outside of Nepal. 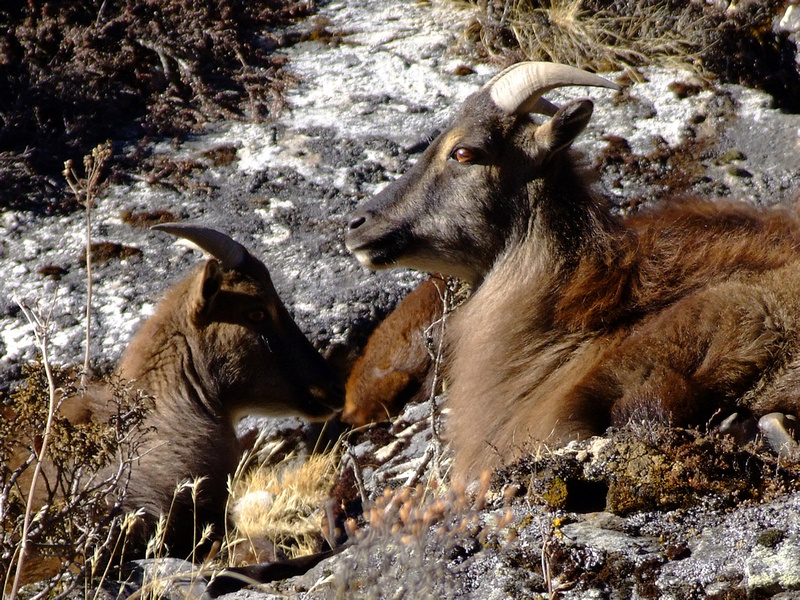 Whilst in Nepal money talks and with it the Tahr has had a hard battle to stay alive as a species. It’s winter and food is scarce. The Tahrs here are feeding on dried shrubs, roots and grass that are basking on this side of the mountain away from the snow and ice. It’s a magical feeding ground for them. Normally the wild Tahr would have heard us coming and shot off long before we could be seen. But food is getting harder to come by, and shockingly they don’t bolt when we try to get closer. We’ve probably just ticked off every conservationist in the world by being here. But so amazed at the Tahr’s I liken it to a once in a lifetime opportunity for me and a formidable opportunity to publish to the world more information about them. A local man carrying a weight of wood stops by. Thinking he was going to scorn us he instead scrambles up the hillside only to join us. Sitting in silence we watch the herd of rare Tahr forage around. The alpha male was so big I knew if he charged we’d be sitting ducks. But, instead at a safe distance we hold a mutual respect. While others feed around him, he watches over his herd with an air of grace. We leave silently. A strong feeling of humble respect overcoming us. 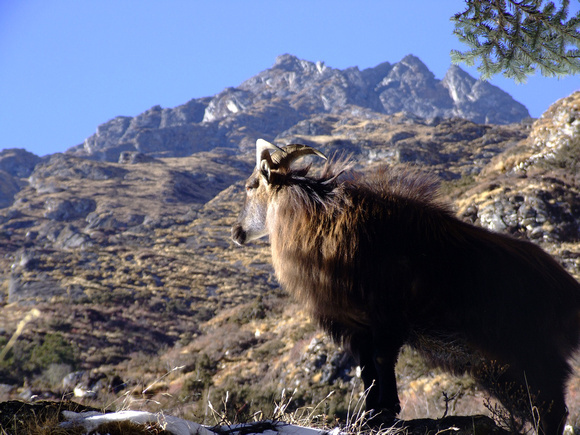 We’ve just had the privilege of getting up close with the rare and beautiful Nepalese Himalayan Tahr. Sign up to my seasonal newsletter! If you already get my updates via email then you are in for some great freebies! Including my Mobile App and Members page! If you’d like in, then sign up here, or read more about being a free member here. Everest Base Camp Trek Day 9 (part 2) The people of the Everest region, including some skiing baby monks! Magnificent looking beast. Hard to believe they are goats. I always think of goats as skinny little things. The lady goats were skinny! Only the Alpha Male was that big! It’s sad to hear of yet another creature being hunted like this in the year 2012. I read about GoDaddy recently and a rich CEO hunting Elephants. One thing that’s good about the internet is that it exposes what many people do for fun these days. Yes, big game hunting is still around. In Nepal Tigers, Rhino and the little know Tahr are frequently targeted by poachers looking to cash in. This was the first time I’d actually seen an international company offering hunting trips here. I’ve never seen a goat like the one in the top photo. Is it just the male that gets that big coat? Yes, just the Alpha Male gets a big coat like that. Some of his challengers get quite big too. But generally they all of much smaller coats. Do they hunt them for meat or for the fur? I just wanted to thank you for this amazing series. I leave for the Everest Base Camp trek in one week. Hopefully I’ll be able to have an experience as amazing as yours (minus the broken boots)! You’re welcome Giazon. Glad you’ve enjoyed it. I hope your trek goes well, the weather is good, and your boots are better than mine! You know, when you write about wildlife, the thing which never failed to capture me is you & them always seem to establish the mutual respect. The last time you did the same with Orangutan in Sabah. I still remember you wrote about some Korean girls attempting to touch the orangutan while taking picture, then someone was using the flash. Despite these are only animals, they don’t deserve less respect than we human being. Good observation there Mandy. I have a lot of respect of wildlife. Always have. They are not cruel to anyone. Even when people try to harm them. A quality humans lack. Wow, this was quite a discovery. I’d be just as excited if I saw one of these. I love their long fur. I’d imagine people would hunt them for the fur also. But I wonder why they’re considered pests in other countries? I read that they are pests in Australia, and or New Zealand and a few other places. One of the ironies of life, endangered at home, a pest elsewhere.